WordPress table plugins offer a convenient method for adding tables to WordPress sites. Whether this is in a post, a page, or even more complex implementations such as a WooCommerce store, these plugins let your visitors quickly navigate large amounts of information and, importantly, find what they’re looking for quickly. This post will answer every question you can possibly have about WordPress table plugins. We’ll start with the basics, including how to add a table to a WordPress post. We’ll then proceed to more innovative implementations which can dynamically create WordPress tables for you – or even dynamically create a table based on the contents of your WooCommerce store. We’ll assume you have a WordPress site, and things like hosting already. If not, you can read our WordPress hosting guide to get you started. We’ll also assume some basic WordPress knowledge, but nothing complex; this guide will take you step-by-step through the world of WordPress table plugins. Create your own unique and tailored table on your WordPress site today! The basic WordPress table plugins are something you’ve probably seen before. At its most basic level, one of these will let you add a table to a WordPress post or page. This will, obviously, have all the advantages of a simple table: it allows visitors to view a large amount of information in one place. A basic plugin will let you add these tables to posts, pages, or widgets, but nowhere else on your site. Furthermore, the data entry will be very similar to a word processor; you’ll create the table, and then need to enter the data manually, or import from an existing spreadsheet. There’ll be no options for complex or automated data entry. The most popular basic WordPress table plugin is TablePress, a free plugin which has hundreds of thousands of installations. This will let you create tables which can be sorted by contents, and with extra features such as links, images added, and pagination. Once the plugin is installed, you’ll have an extra menu item – TablePress – added to your WordPress Dashboard, where you can create and manage your tables. You can Add New to create a table from scratch, or Import to create your table from an existing file. 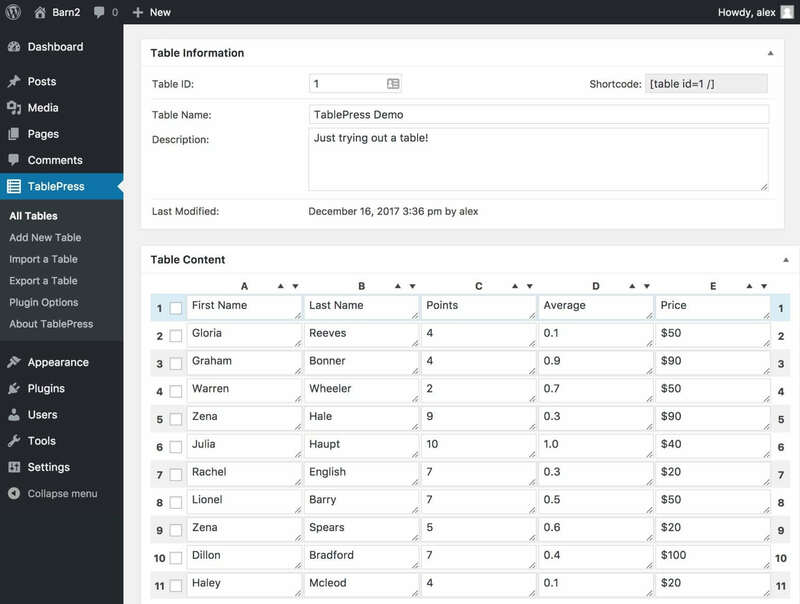 Once your data is added, you can use the Table Content section to customize what data displays, the Table Manipulation section to control how the data displays, and the Table Information section will show the shortcode (such as [table id=1 /]) which can be pasted into a WordPress post, page, or text widget, in order to display the table on your site. At the bottom of the page, you can control if your table is sortable. Showing your table on the front-end of your site is straightforward: copy the shortcode, and paste it in the post, page, or text widget you want it to display. You can now show off your table to visitors! If you need to update any of the data, return to the TablePress options, select your table, make the changes, and then save. There are several other WordPress table plugins available, including wpDataTables, Advanced Tables and UltimateTables. All of these work in broadly the same way, and have the same limitations as TablePress. You need to manually enter and update data, and extra features such as links to other content are possible, but frustrating, time-consuming, and tedious to do in practice. To tackle these limitations, you’ll need to turn to a more innovative solution. This is precisely what we’ll look at next. Posts Table Pro is an innovative improvement to WordPress table plugins. Posts Table Pro creates tables dynamically, using information already on your WordPress site. This could be posts, pages, products (from any e-commerce plugin), documents, upcoming events (from any events plugin), portfolio items, and literally anything else. If you have data stored as a post or custom post type in WordPress, Posts Table Pro can automatically create a sortable table for you. This makes it incredibly easy for you – as there’s no data entry, no data to ever update, and everything happens automatically. It’s also incredibly easy for your visitors, as they’ll be able to quickly find what they’re looking for in an always-up-to-date, sortable and searchable table. Custom post types are WordPress’ way of storing data: plugins such as WooCommerce, The Events Calendar, and advanced plugins such as Pods (which lets you create custom data setups), all create custom post types. Technically, any WordPress post or page is a custom post type too; essentially any kind of content stored in WordPress is probably a custom post type. As Posts Table Pro can dynamically create tables form any custom post type, this makes it incredibly powerful. In addition to all this, Posts Table Pro comes with a ton of premium features. These include superb styling, easy linking to content used to generate the table (this makes it perfect for creating libraries and databases), and lazy loading for faster load times. You can watch the video below to see how the plugin works in practice. As you’d expect, automatically creating your own table with Posts Table Pro is easy :) You’ll need to get the plugin here, and then download it from your Barn2 account. Head to Plugins → Add New → Upload plugin, and then select the ZIP file you just downloaded. Install, and then Activate the plugin. You’ll find the settings under Settings → Posts Table Pro; head here, and activate your licence key. You’re now to create your tables! Creating your first table is disarmingly easy: just enter [posts_table] on any WordPress post, page, or text widget, and you’ll automatically get the default configuration, which is to display your site’s latest posts in a table. From here, you can start configuring your shortcode in order to customize what displays. If you wanted to, for example, switch from displaying posts to displaying pages you’d use the following shortcode:[posts_table columns="title,content" post_type="page"]. There’s a wealth of possibilities here. You can see the full list of parameters here, or get some inspiration with five of our favourite advanced use-cases below. The most exciting thing about Posts Table Pro is its flexibility means you can use it to create WordPress tables in all sorts of scenarios, and for all sorts of advanced usages. In this section we’ll share some of our favourite advanced usages for our advanced WordPress table plugin. We often find the best ideas for using Posts Table Pro come from our customers putting the plugin into practice on their website, so if you don’t see a usage which strikes you as something you need in this list, we’ve included a couple of real-world case studies which might provide the spark of inspiration you need. WordPress Document Library: this presents a library of your documents in a file-manager style format, which makes it easy for you to create a knowledge base, publications database, or share files. Posts Table Pro makes it easy to add any extra options you need on your document library, such as download links, file types or sizes, or any custom metadata. Events table or calendar: this lists upcoming events somewhere on your WordPress site! Plenty of plugins can do this, but Posts Table Pro lets you create a sortable calendar. This is perfect for large numbers of events, or where visitors will need to search to find what they need. 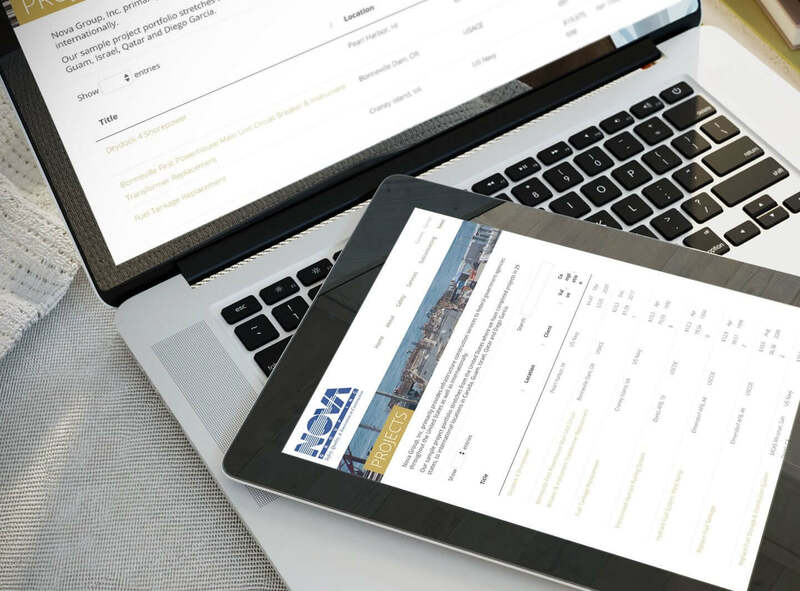 Member directory: this lets you create a sortable list of your organisation’s members, for either internal or external usage. Obviously, with Posts Table Pro, you can add whatever extra data is needed, and as the members are added as custom post types, it’s even possible to click-through to read more about each individual. Library of audio files: this lets you embed audio files in a filterable and sortable table. Whether you’re previewing album tracks, or audio recordings, Posts Table Pro makes it easy for you to add all the information a visitor needs to see, and for the visitor to quickly find what they need. Library of videos: this lets you create a grid of embedded videos, which can be filtered and sorted for the convenience of your visitors. If you’ve got a large quantity of videos, such as for a conference, this is perfect for you. It’s easier, of course, to imagine how these implementations of Posts Table Pro would look like on your site, when you can actually see a real-world example. Here’s one from Dr. Claudia Welch, a Doctor of Oriental Medicine, and author of several books and courses. She teaches a lot, and has a created a wealth of courses which are for sale on her website. Dr. Welch found that some students prefer to buy individual chapters from her courses, rather than the full thing. This means she offers a lot of different products – 46 to be precise. Dr. Welch’s website uses Posts Table Pro to list all of these courses, sortable by name, category, and price. Visitors can click on any of the courses to find out more information, and buy if they wish. Without Posts Table Pro, Dr. Welch’s site would have a very large number of individual products available, and no easy way for these to be navigated. A traditional archive would be much slower to browse, and a manually made table would not necessarily be sortable, and would need to be updated as every new product is added. WooCommerce users can take things one step further with WooCommerce Product Table. WooCommerce Product Table is purpose-built for the world’s best e-commerce platform, and automatically lists products in searchable and sortable tables. This makes it ideal for WooCommerce stores with complex product setups, such as wholesale stores, restaurants, and any catalogue or order form. The setup process is straightforward: get the plugin here, and then download it from your Barn2 account. Head to Plugins → Add New → Upload plugin, and then select the ZIP file you just downloaded. Install, and then Activate the plugin. You can enter your licence key under WooCommerce → Settings → Products → Product tables. Save changes, and then use the options to set your default table settings. Create a WooCommerce restaurant ordering system: use WooCommerce Product Table to create your very own Just Eat alternative online food ordering system. Make a WooCommerce directory: use the plugin to create a product directory to sell books, audio, music, or anything which is displayed in a directory. Create a WooCommerce-powered “build your own product” store: this is one of the most complex and exciting WooCommerce Product Table integrations, showing how to create a store which offers “build your own” items such as veg boxes, luxury food, or gift boxes. Create a WooCommerce order form: WooCommerce lacks a good order form out of the box, and WooCommerce Product Table solves this problem. WooCommerce for photographers: use the plugin’s advanced features in order to build a fully featured WooCommerce store ideal for photographers. These advanced integrations are just the tip of the iceberg. This is a plugin which can add much-needed functionality, tailored to your site. If you’re using WooCommerce and need to create a table of your products, WooCommerce Product Table is the plugin for you. Posts Table Pro is the best WordPress table plugin. The plugin can automatically create (and update) your tables for you, saving you a huge amount of time. You also get advanced features such as integration with a huge number of plugins, professional support, and frequent updates. We recommend this for the vast majority of sites. WooCommerce Product Table is the best in class for WooCommerce stores. If you’re running a WooCommerce store, this plugin is going to automatically generate product tables for you, and in doing so increase your conversion rate – and profits. This is a hugely popular plugin, and is loved by customers for a good reason! It works, and it works really well. Basic WordPress table plugins aren’t ideal, as they require manual data entry. They also miss advanced features. If you have to use one of these, then go for TablePress. We’d love to hear from you next: which plugin will you choose? How are you using WordPress table plugins on your website? You can share your thoughts and input in the comments below. Thanks for reading, and enjoy your tables.